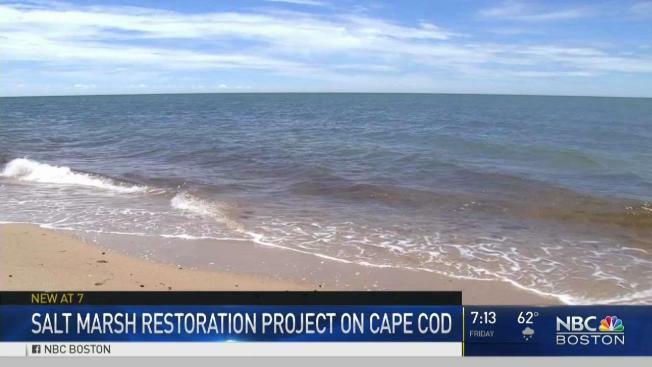 A massive salt marsh restoration project is in place on Cape Cod. Cape Cod is known for its ponds, beaches and lobster rolls. But in a few years, it may also be known for its marshes. A massive salt marsh restoration project, said to be the largest of its kind in the northeast, is in the works on the Cape. "I think I'll be glad when it's restored to what it should be," said John Portnoy, a retired restoration ecologist and board member of Friends of Herring River. In Wellfleet, Massachusetts, the Chequessett Neck Dike divides the Herring River salt marsh from the bay. The current landscape is unrecognizable to the natural wonder it once was. One hundred years ago, the natural flow of salt water from the bay was shut off to improve farmland and kill mosquitoes. The side effects were instantaneous, dramatic, and still felt today. Sulfuric acid was released, marine wildlife was killed and invasive plants took over. "The trees have kind of crept lower," said Tim Smith, a restoration ecologist for the Cape Cod National Seashore. About 10 acres of the marsh remain, a reflection of what the land once looked like. More than 1,000 acres need to be restored. "Salt marsh vegetation is know for its ecological productivity — its ability to sequester carbon," said Smith. A plan is now in place to open the dike, restoring the marsh to what it was. The Herring River Restoration Committee has fought to allow salt water back into the marsh, along with the towns of Wellfleet and Truro, as well as the Cape Cod National Seashore. Workers are going to replace the dike with a bridge that will regulate the tide. "The project estimate is roughly about $40-$45 million," said Don Palladino, president of Friends of Herring River. "We will be seeking ... federal, state, and private funding to accomplish that and we hope to have that accomplished by 2020." To avoid a shock in transition for the wildlife and plants, the change will come in steps. "It'll be really amazing to see the tide roll in for the first time," said Portnoy. Almost all of the vegetation currently there will be gone. The grassy marsh will return — a century-long masking of a hidden wonder.